Read the excerpts of the President Trump’s first State of the Union Address, delivered 11 months after being elected into office. "North Korea's reckless pursuit of nuclear missiles could very soon threaten our homeland," US President Donald Trump said during his State of the Union address. "We are waging a campaign of maximum pressure to prevent that from happening… I will not repeat the mistakes of past administrations that got us into this dangerous position." During his speech, Trump honored a North Korean defector as Ji Seong-ho, who escaped from the country back in 2006, was given a place just seats away from First Lady Melania Trump. "Today he lives in Seoul, where he rescues other defectors, and broadcasts into North Korea what the regime fears the most: the truth," the US president said. — Matt Batzel (@MattBatzel) 31 января 2018 г. In his speech, Trump reported several achievements that his administration reached in the first year. "Since the election, we have created 2.4 million new jobs, including 200,000 new jobs in manufacturing alone. After years of wage stagnation, we are finally seeing rising wages." He also pointed out that both African American and Hispanic American unemployment have hit the lowest record ever recorded. He also added that stock market exchange has added $8 trillion since he was elected in the office. President Trump praised the tax cut that has been approved by the Congress. "A typical family of four making $75,000 will see their tax bill reduced by $2,000 — slashing their tax bill in half." "We eliminated an especially cruel tax that fell mostly on Americans making less than $50,000 a year — forcing them to pay tremendous penalties simply because they could not afford government-ordered health plans. We repealed the core of disastrous Obamacare — the individual mandate is now gone." The tax cut has also made it interesting for large companies to repatriate money, the President said. "Apple has just announced it plans to invest a total of $350bn in America, and hire another 20,000 workers." He also added that Exxonmobil announced $50 billion investment in the United States, without elaboration. Talking about economy, US President Donald Trump pledged to fix bad trade deals and negotiate new agreements. "America has also finally turned the page on decades of unfair trade deals that sacrificed our prosperity and shipped away our companies, our jobs, and our wealth," Trump said. "The era of economic surrender is totally over. From now on, we expect trading relationships to be fair and… reciprocal. We will work to fix bad trade deals and negotiate new ones." US President Donald Trump called on the Congress to pass a legislation that would generate at least $1.5 trillion for new investments into the American infrastructure. "Tonight, I am calling on the Congress to produce a bill that generates at least $1.5 trillion for the new infrastructure investment," Trump said. — Fox News (@FoxNews) 31 января 2018 г. "The first pillar of our framework generously offers a path to citizenship for 1.8 million illegal immigrants who were brought here by their parents at a young age — that covers almost three times more people than the previous administration," Donald Trump said, referring to the so-called "dreamers," or children who were illegally brought into US by their parents. US Congress must work to approve immigration laws to prevent MS-13 and other criminal gangs from entering the United States, the President said. "Tonight, I am calling on the Congress to finally close the deadly loopholes that have allowed MS-13, and other criminal gangs, to break into our country," he said. "We have proposed new legislation that will fix our immigration laws, and support our ICE and Border Patrol Agents; these are great people, these are great, great people that work so hard in the midst of great danger so that this cannot ever happen again." The United States needs a wall along the US-Mexican border and an end to the current visa lottery system as part of a four pillar immigration reform plan, US President said. "The second pillar fully secures the border. That means building a great wall on the Southern border," he said. "The third pillar ends the visa lottery — a program that randomly hands out green cards without any regard for skill, merit, or the safety of American people." 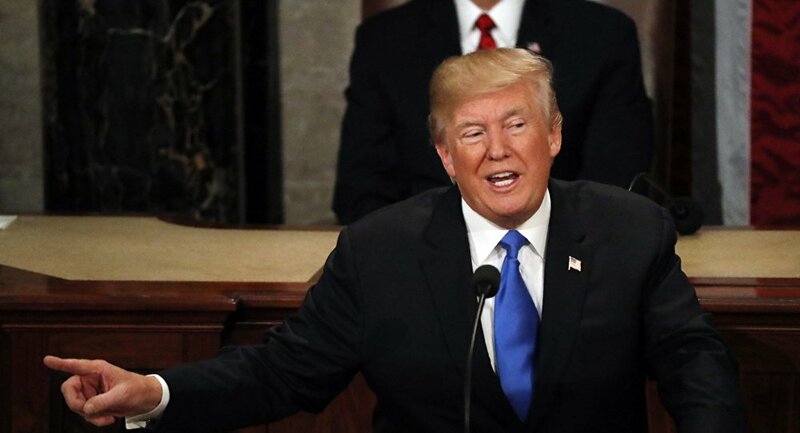 The United States is facing rivals like China and Russia which challenge American interests, US President Donald Trump said during his State of the Union address. "Around the world, we face rogue regimes, terrorist groups, and rivals like China and Russia that challenge our interests, our economy, and our values," Trump said. "In confronting these dangers, we know that weakness is the surest path to conflict, and unmatched power is the surest means of our defense." He also focused on what Washington sees as Iran's troublesome activities across the Middle East, as well as North Korea's nuclear and ballistic missile programs. "America stands with the people of Iran in their courageous struggle for freedom," he said, while warning that "North Korea's reckless pursuit of nuclear missiles could very soon threaten our homeland." US President Donald Trump called on the US Congress to end the defense sequester and fully finance the American military. "I am asking the Congress to end the dangerous defense sequester and fully fund our great military," Trump said. US President Donald Trump said in his State of the Union speech that the United States foolishly released hundreds of terrorists, including the leader of the Daesh terrorist group. "In the past, we have foolishly released hundreds and hundreds of dangerous terrorists, only to meet them again on the battlefield — including the [Daesh] leader, al-Baghdadi," Trump said. US President Donald Trump announced in his address that he had signed an order to keep the detention center at Guantanamo Bay, Cuba open. "I just signed an order directing Secretary Mattis to reexamine our military detention policy and to keep open the detention facilities at Guantánamo Bay," Trump said. The US military in Afghanistan now operates with new rules of engagement and will be not be restrained or hampered by artificial time-lines, the President said. "Our warriors in Afghanistan also have new rules of engagement," he said. "Along with their heroic Afghan partners, our military is no longer undermined by artificial time-lines, and we no longer tell our enemies our plans." He also said that the United States must modernize and rebuild its nuclear arsenal, but hopefully will never have to use it. "As part of our defense, we must modernize and rebuild our nuclear arsenal, hopefully never having to use it, but making it so strong and powerful that it will deter any acts of aggression by any other nation or anyone else," he said. Talking about fight against Daesh, Trump claimed that the US-Coalition cleared "almost 100%" of Daesh territory, both in Iraq and Syria. "I am proud to report that the coalition to defeat [Daesh] has liberated almost 100% of the territory once held by these killers in Iraq and Syria," he said. Donald Trump also mentioned the recognition of Jerusalem as the capital of Israel. Talking about the issue, he called on Congress to pass legislation that will cut US aid to countries that voted against the US during the UN vote on Jerusalem. "Dozens of countries voted in the United Nations General Assembly against America's sovereign right to make this recognition. American taxpayers generously send those same countries billions of dollars in aid every year," he said. "That is why, tonight, I am asking the Congress to pass legislation to help ensure American foreign-assistance dollars always serve American interests, and only go to America's friends."